A Place to find inspiration, learn techniques and have some fun! so we can get to using our new stuff too! sorry< my laptop is acting up< so most of my keys are on caps lock< whether the key is on or off< go figure> I will have to fix it! I have actually been scrapping and may be able to try this! Oh YEAH! Can't wait to see what you come up with! Ok Ladies, I'm not real sure I like it, but it's made totally (except for the base card itself - American Crafts-) from scraps! Well, and things from my stash:) I've had the Fastenator staples foreeeeever, I really need to use them more. They are cute. And the letters, foreeeever too. (seems like anyway). The paper is by Luxe Designs. The buttons are Autumn Leaves. 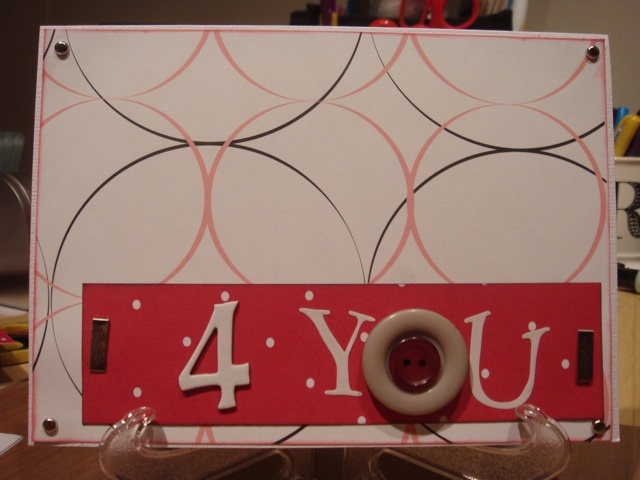 Chipboard number, by American Crafts -Thickers-. And the brads, Making Memories. TFL!